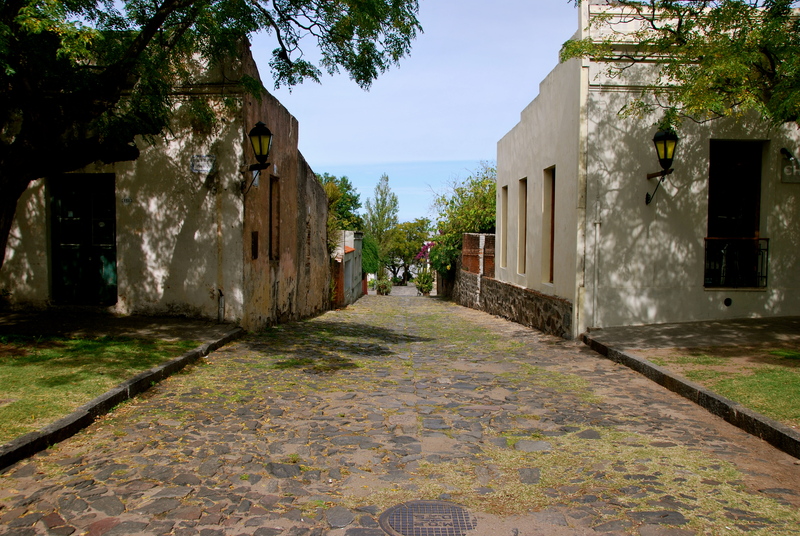 ← Wine, Wine, Wine – Mendoza, Argentina. 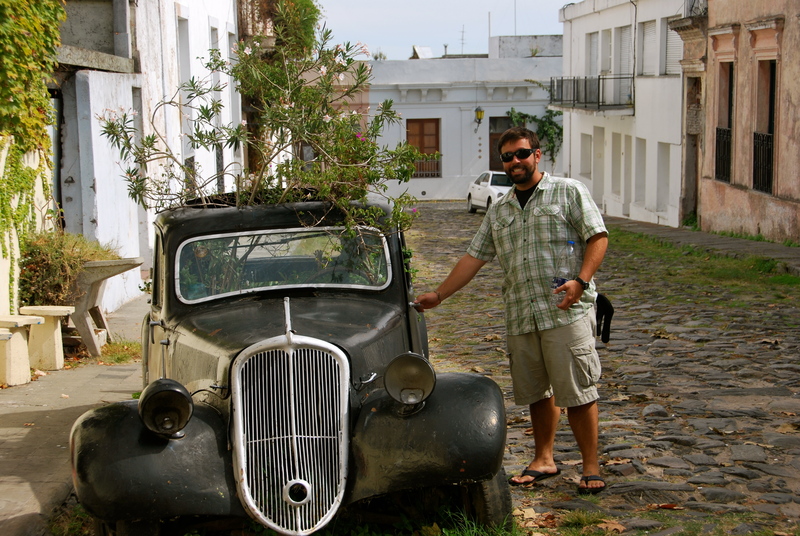 After a short overnight bus to Buenos Aires, we took a ferry across the Rio Plata to Colonia del Sacramento, Uruguay. 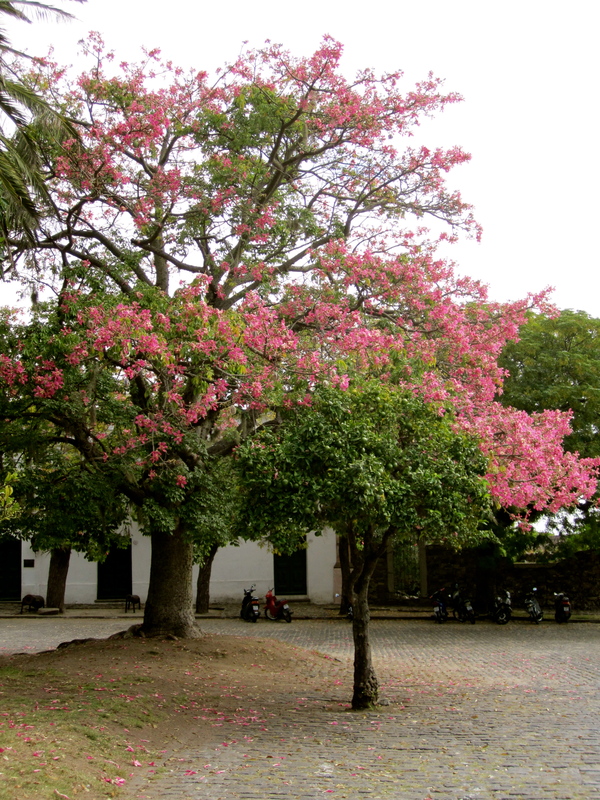 Colonia is an old fort city whose ownership has been passed between Spain and Portugal more times than we can count. 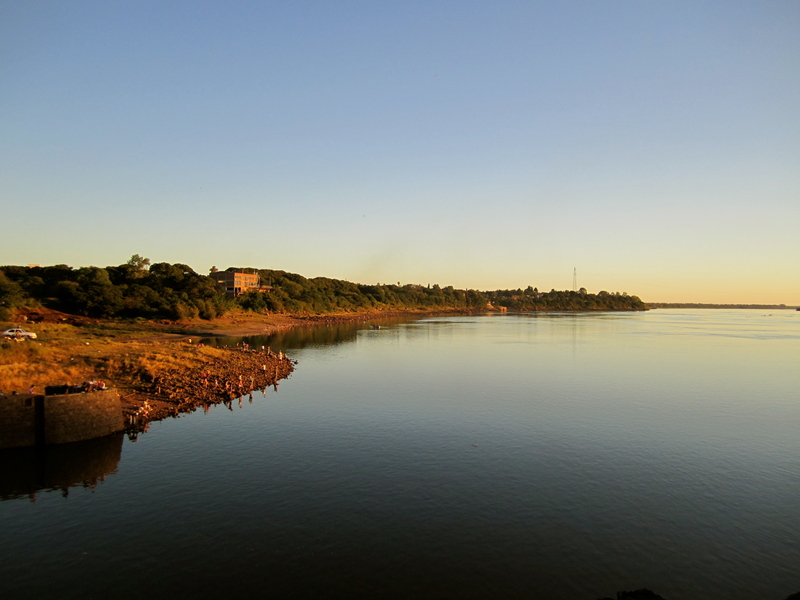 This town is well situated to keep a close eye on the Rio Plata, and it is simply stunning. Canons no longer boom in this city, but the collective sound of the cameras is just about as loud. This is one of the most photogenic cities we had ever encountered. It seems that at every turn there was yet another amazing picture. 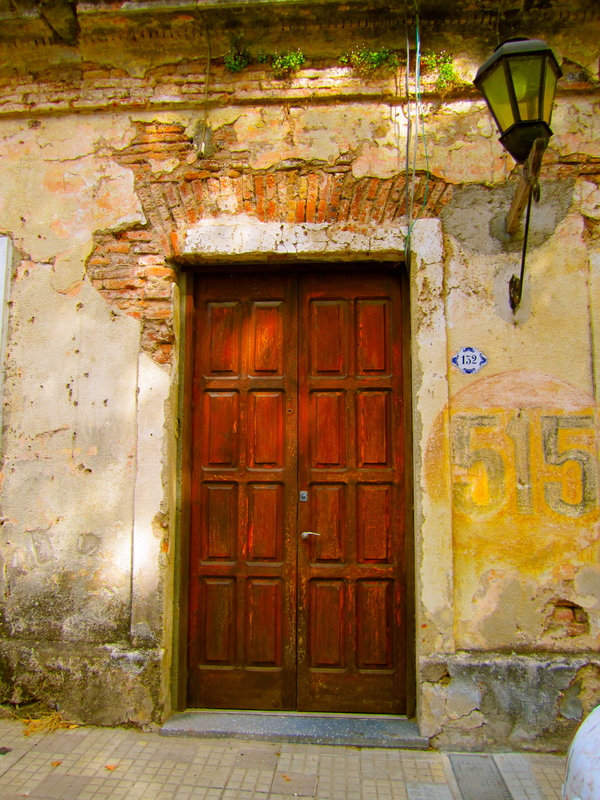 One of Colonia’s many picturesque doors. This town has it fair share of shady (not the bad kind) plazas and streets to sit in and pass the time. Beautiful tree in the plaza. Not sure what the name of this tree is, but we want one. 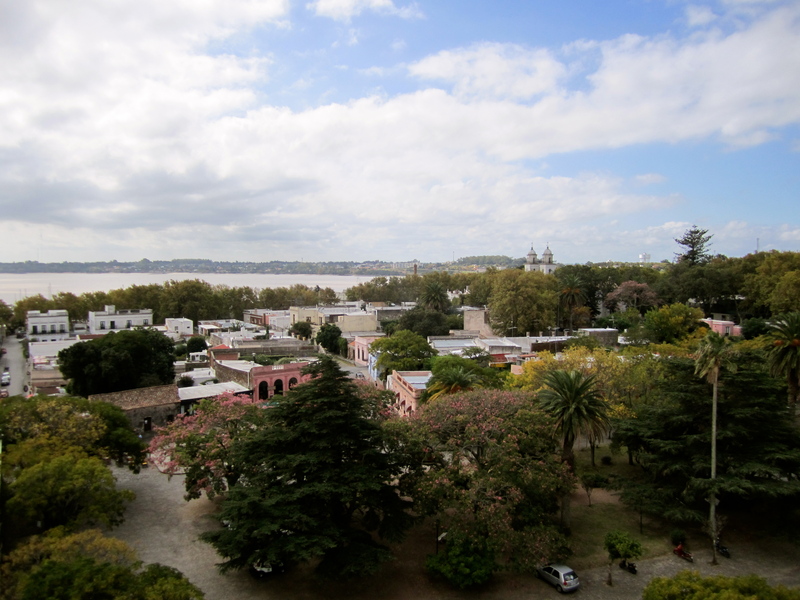 Colonia draws a huge amount of weekenders from Buenos Aires are looking to escape the hustle and bustle of the city. We luckily planned our trip during the week and were able to have the town almost to ourselves. We spent the time wandering, relaxing, eating, and taking endless pictures. Joe and our rental car. The tree counted as a third passenger. 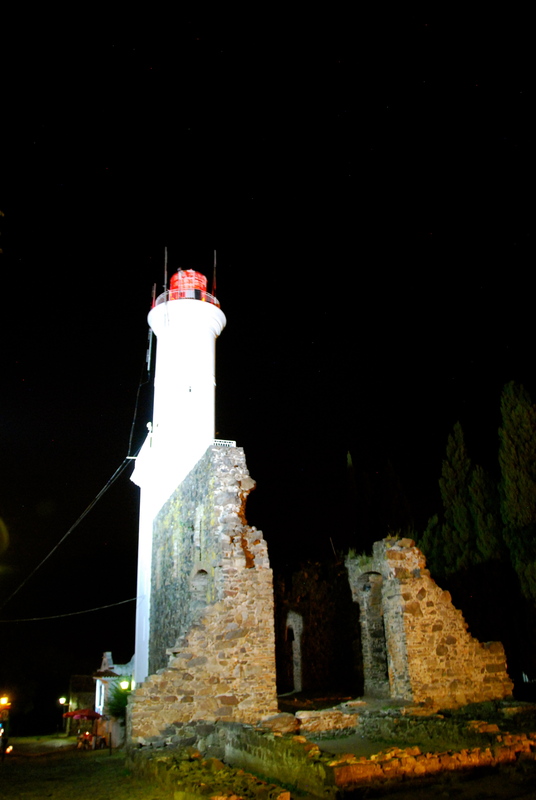 We climbed the lighthouse to take in the views from above. The city is beautiful from all angles, but the brown river leaves something to be desired. 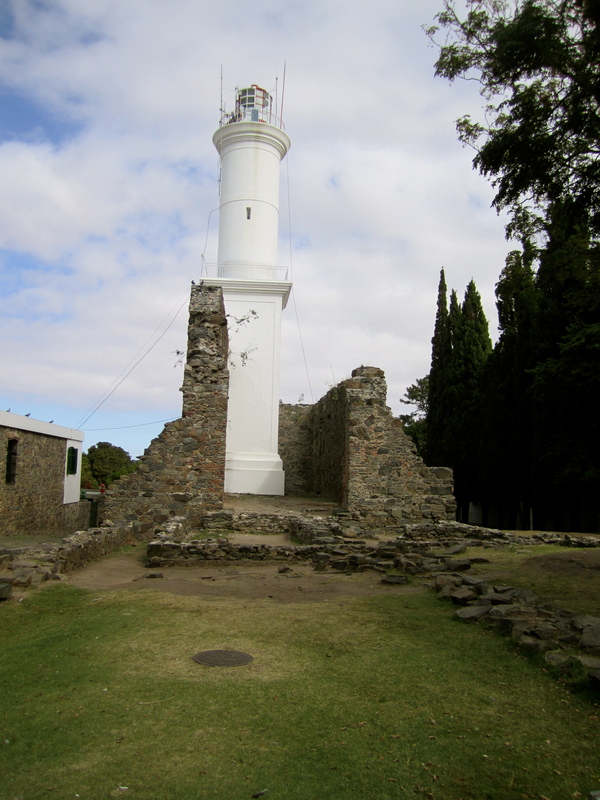 There is not too much to do in Colonia except walk around and enjoy the views, which was just fine with us. 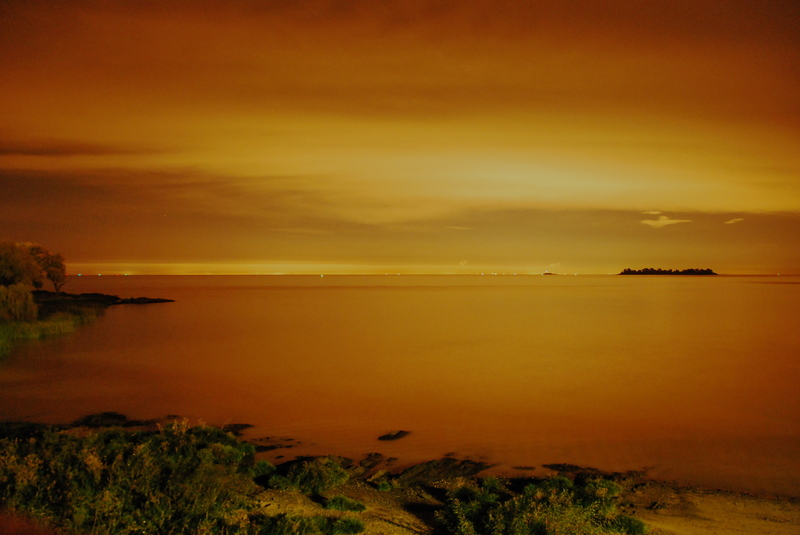 One night, we hit the streets to take a few pictures of this beautiful town in the dark. Rio Plata and Buenos Aires in the background. Candlelit tables… this picture doesn’t do it justice. 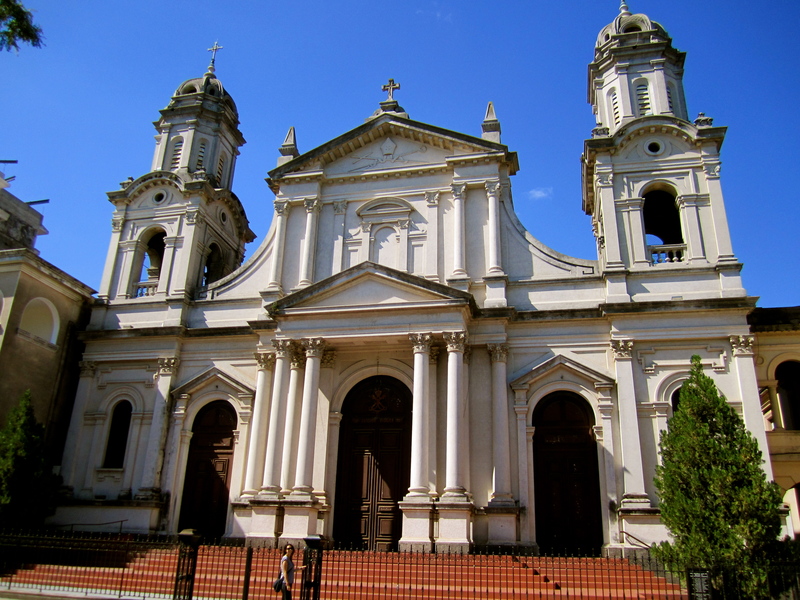 Salto is an eight-hour bus ride from Colonia and it also sits along the Rio Plata. 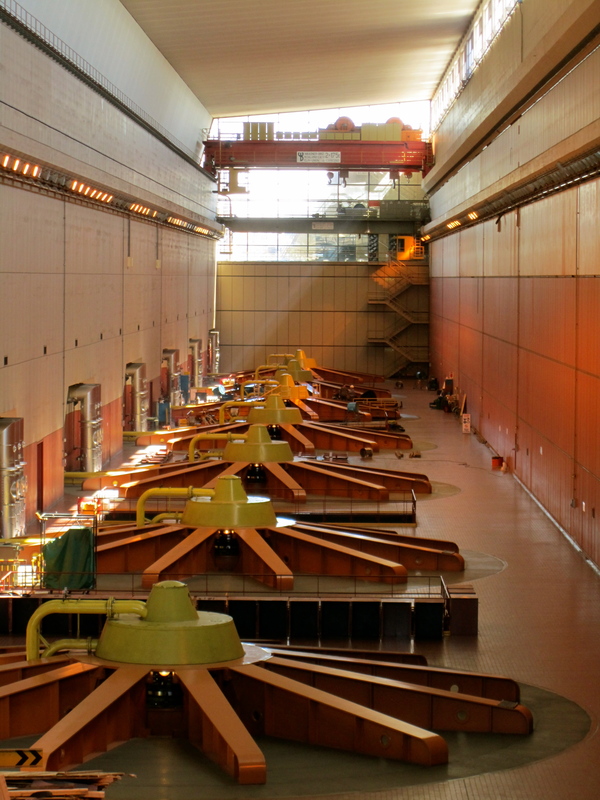 As said before, this area is famous for its dam which supplies Uruguay with 60% of it power. Yet even more exhilarating than the tour itself, is the fact that the tour was free, including the bus to get there from town. We jumped at the opportunity to take a dam tour, and we were pretty sure we were going to have a damn good time. Damn that is a cool turbine model. 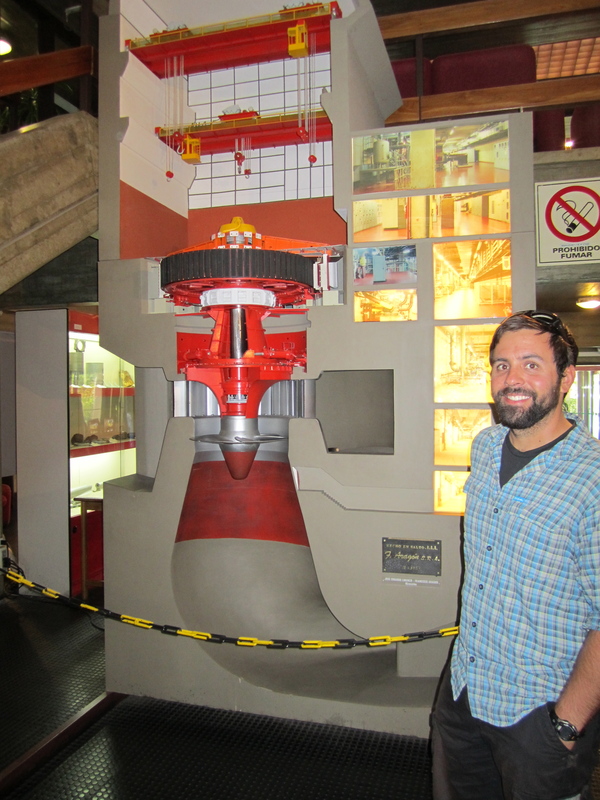 We had a great time on the free dam tour, and would recommend this dam activity for any tourist in the dam area. If stopping a river and turning it into power is not enough for you, Salto has a few other things to offer. Like many of the cities we visited on this trip, this town has many plazas, tree-lined streets, and old buildings to admire. Kris in front of a church. 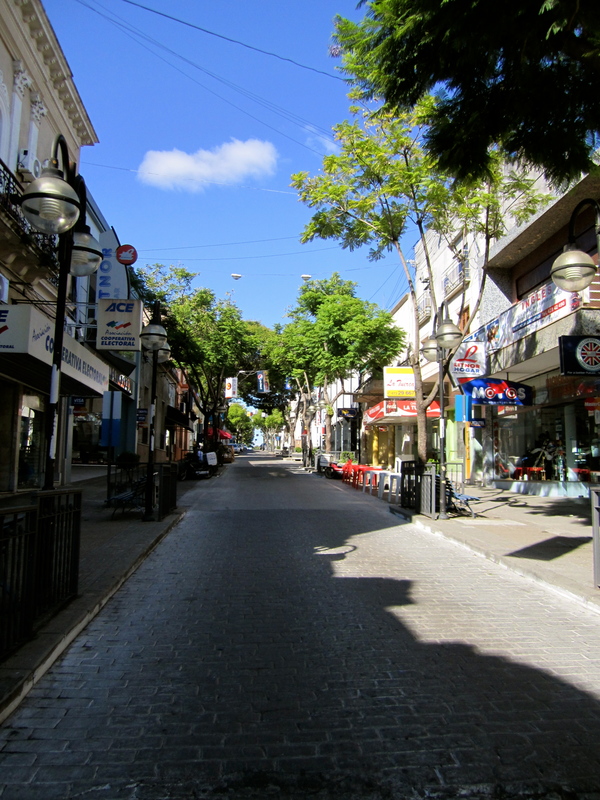 The happening downtown of Salto. 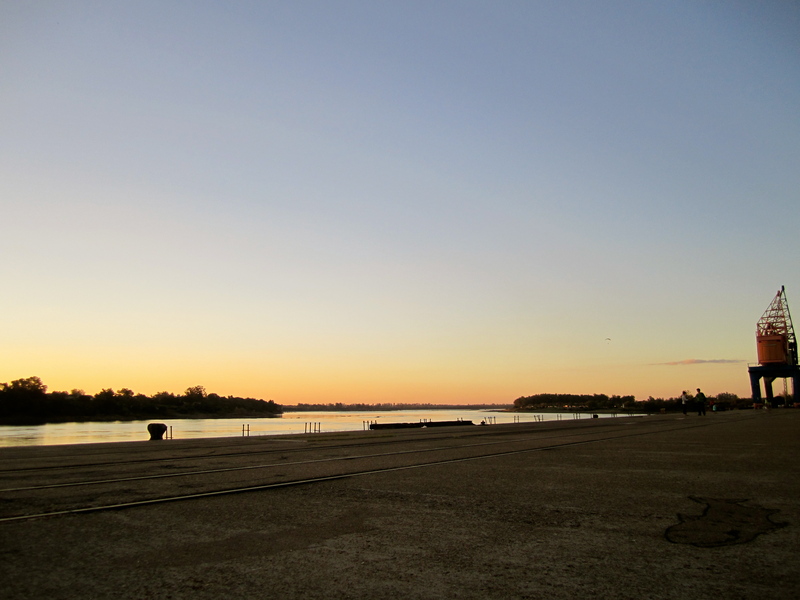 At sunset, it seems like the entire town grabs their fishing poles and mate (a tea like drink that is a near obsession in Uruguay), and heads down to the river. We tried to blend in: we hung out on the pier and tried to blend with the locals and enjoy the sunset. The only thing that gave us away was the fact that we didn’t have a mate to share. 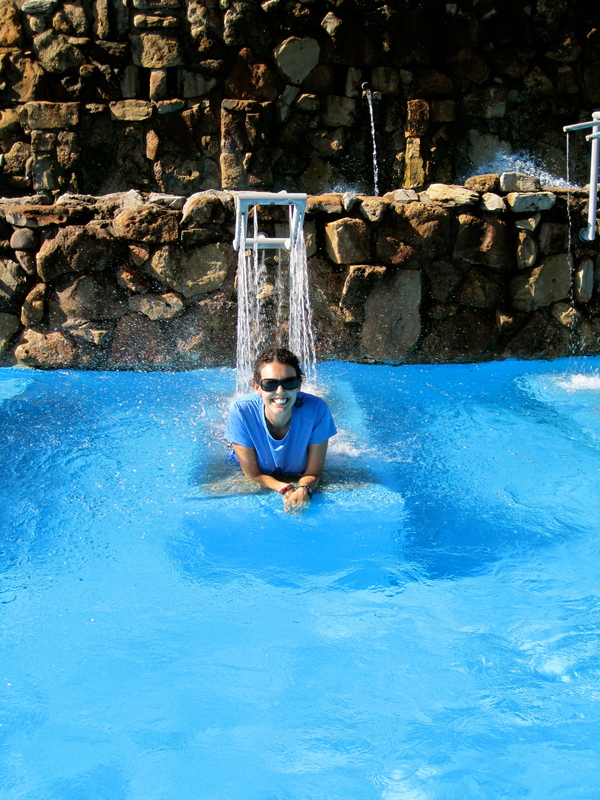 To round off our time in Salto, we went to one of the many thermal baths to soak our bones. We went with some others from our hostel, and we were quite the little United Nations. Our group consisted of us (the American component), a Frenchman, a German, an Italian, a Thai, and a Dutch girl. 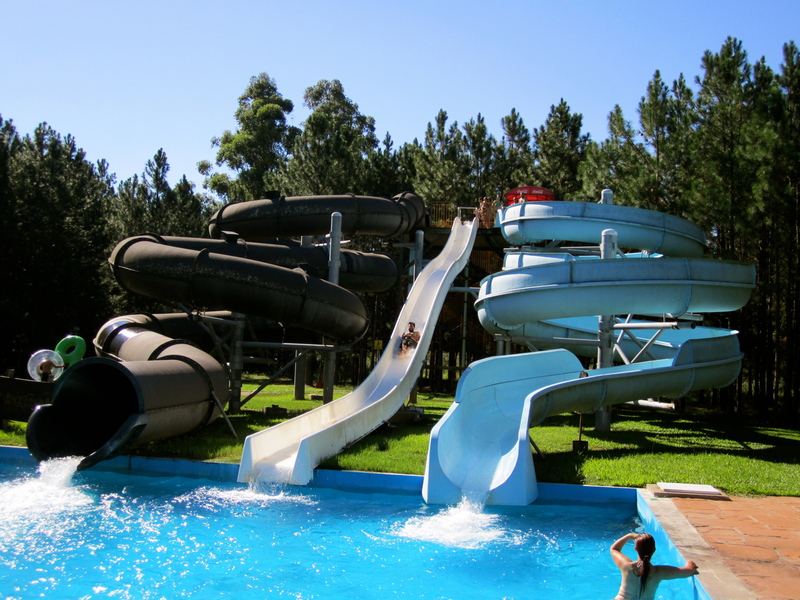 These were not your typical natural “spa-like” thermal baths, because these ones have lazy rivers, wave pools, and many slides. After having all the damn fun we could have (tired of that joke yet?! 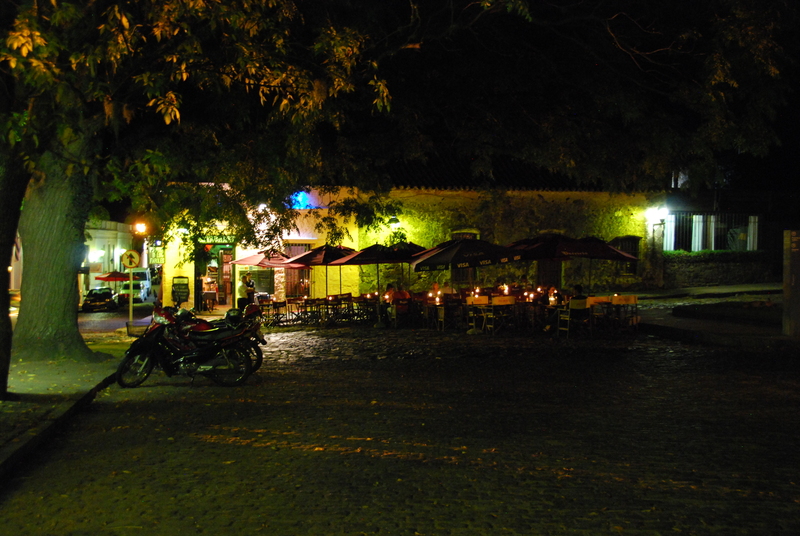 ), we set off for Gaucho country, and a place most tourists do not visit, Tacuarembo. Tacuarembo is in the middle of Uruguay and the gauchos are still alive and well. This is a great place to sit back, take in the slow-paced lifestyle, and play spot the cowboy. 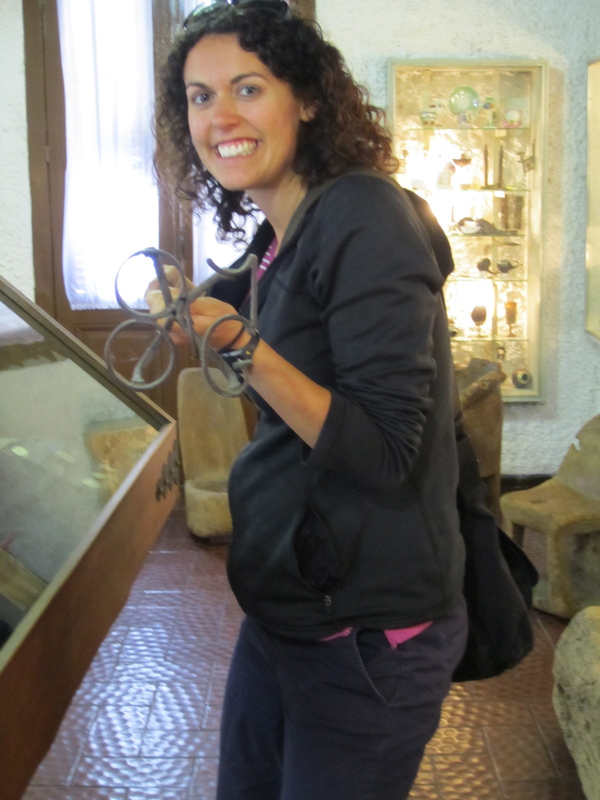 We did just about everything there is to do in Tacuarembo, including visiting the very famous one room Gaucho museum. Kris trying to brand Joe. 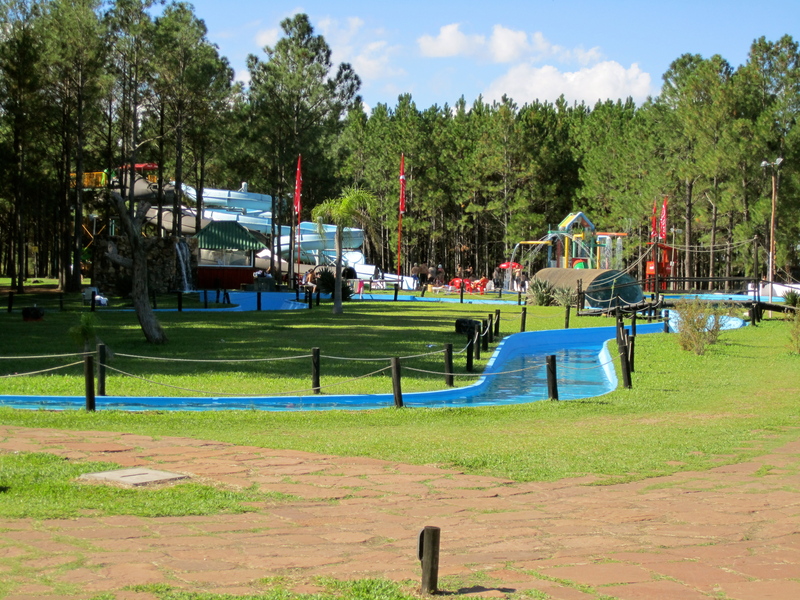 The other “touristy” thing to do in Tacurembo is a visit the Valle Eden for its natural beauty and the museum dedicated to Carlos Gardel (a famous tango singer). 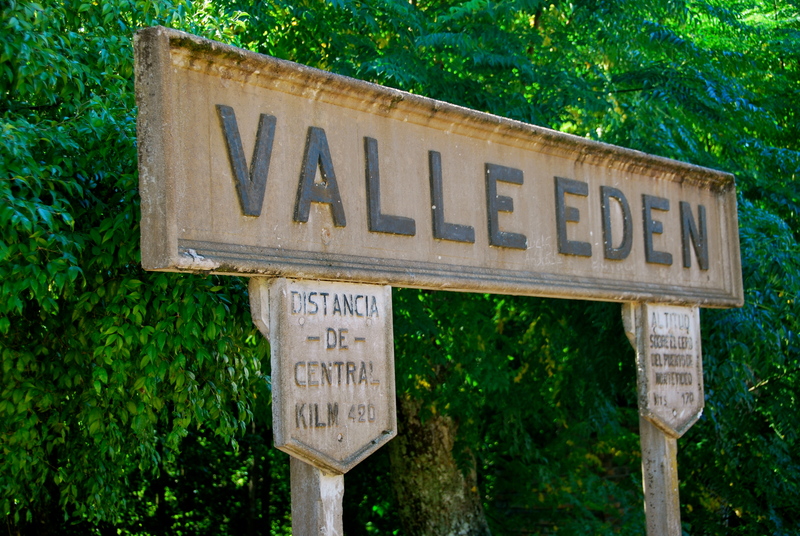 Valle Eden train station sign. 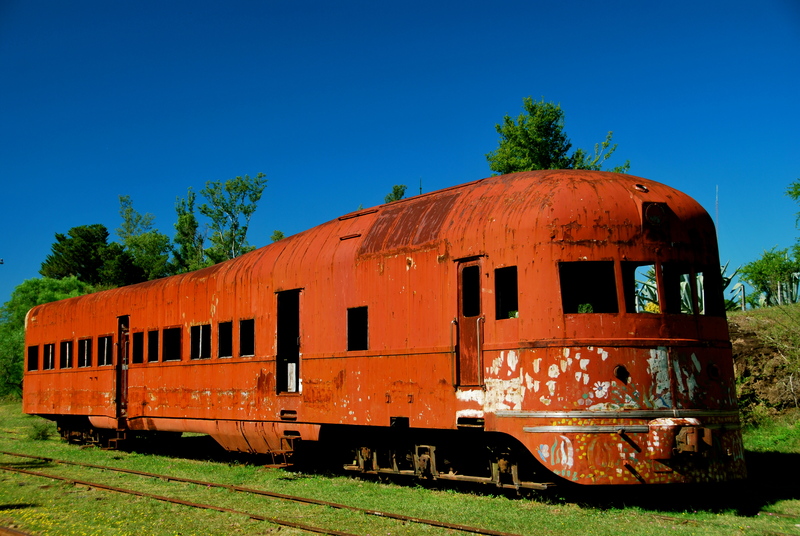 Old train. Don’t worry, we took the bus here. 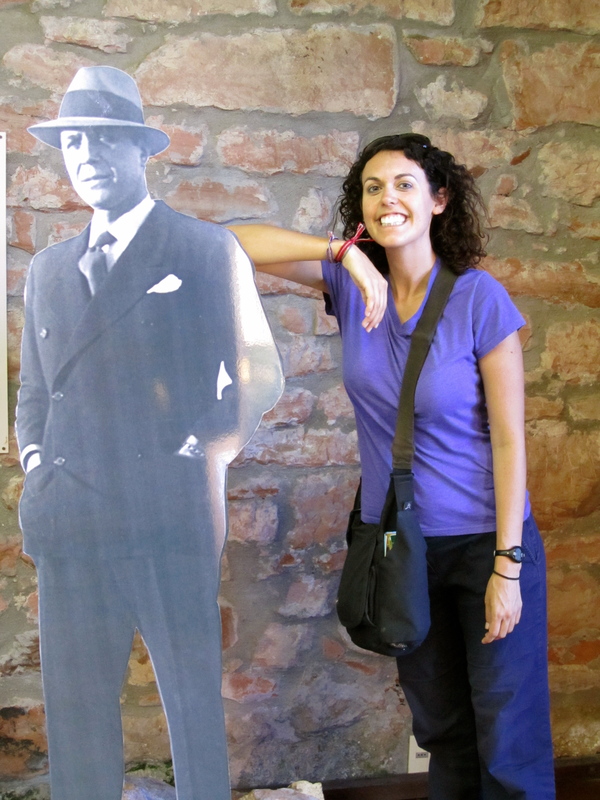 The Carlos Gardel museum is solely in existence to prove that this famous tango singer was born in Uruguay. 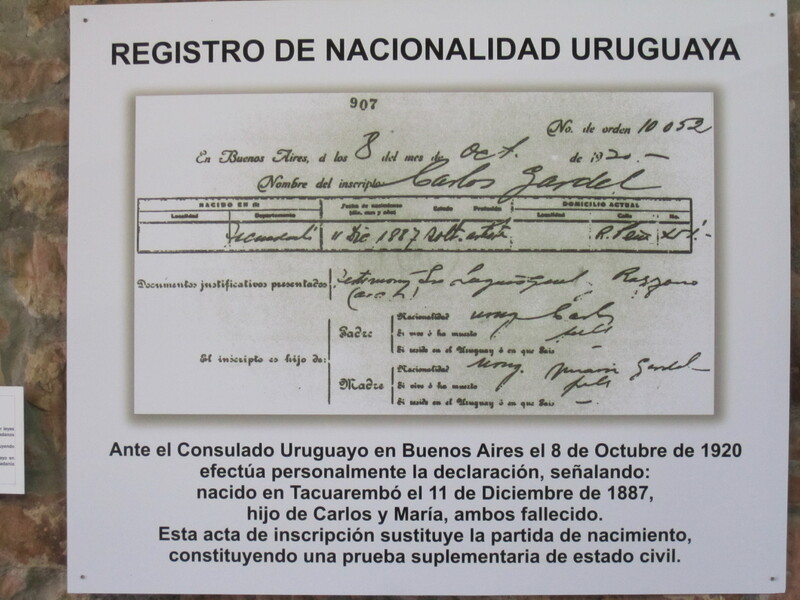 He has been claimed by Uruguay, Argentina, and even France, but only Uruguay can come up with a birth certificate (which they have blown up and prominently displayed). We left as believers that Carlos is from Uruguay. He reminded us of someone from The Rat Pack, and tragically, he met his end in a plane crash in Colombia. 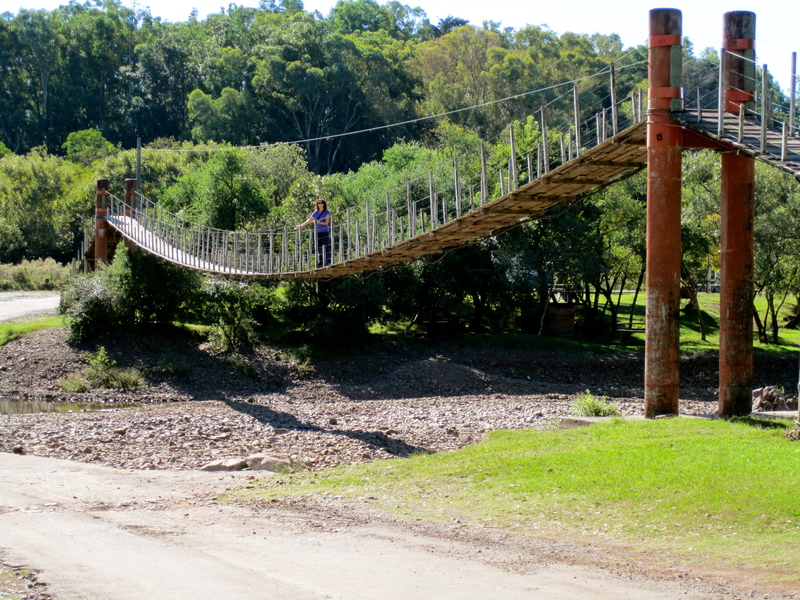 Kris crossing a bridge in the Valle Eden. 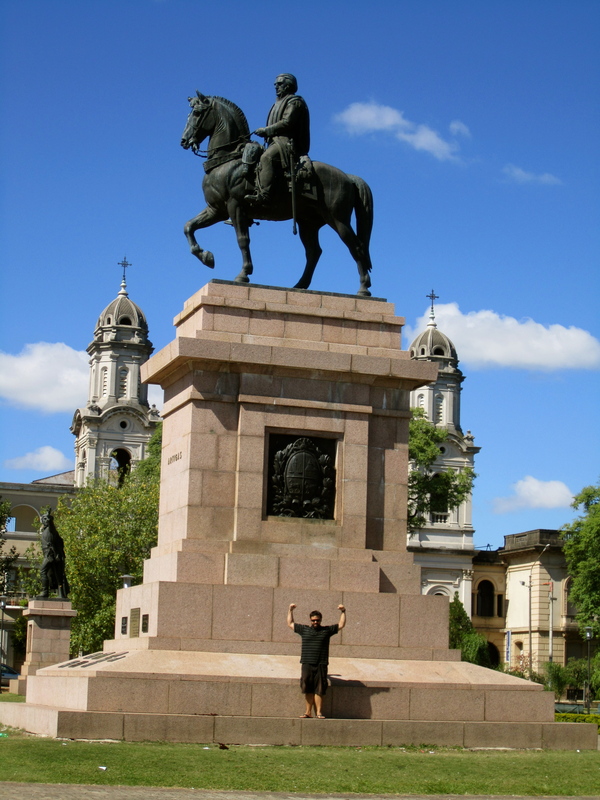 Uruguay might not have many major attractions, except for the dam, but immersing yourself in their culture makes for a nice (and relaxing) trip in itself. Continuing the theme, I found this is to be a dam interesting post. 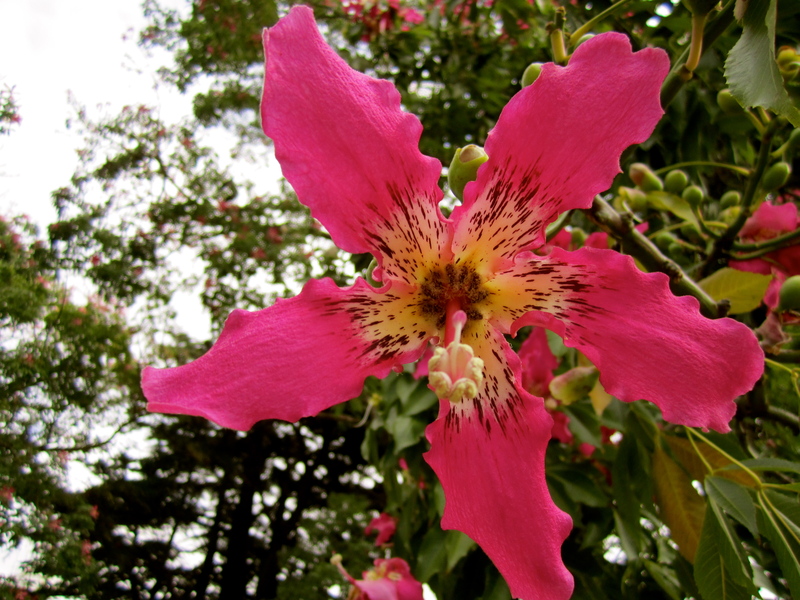 The name of that pink flowering tree is the Floss Silk Tree (Chorisia Speciosa), and Kristen, there are a number of these trees growing in your native city of Camarillo. Very disappointing you didn’t recognize it. We’ll do a botanical tour next time you’re home. That’s the best damn dam report I’ve ever read!